London 1 July 2008 - The Commission for Looted Art in Europe announced today the restitution from the Israel Museum Jerusalem of three gold-glass bases dating from the fourth century AD to the heirs of the Działyńska Collection at Gołuchów Castle in Poland. The gold-glass bases were seized by the Nazis in 1941 and their location was unknown to the family for over 60 years. Eight weeks ago a 13th century Limoges enamel cross from the same collection was restituted from Zell am See in Austria to the family, who are now based in London. Of the three bases, two are decorated with some of the earliest known depictions of Jewish symbols from the Second Temple period to appear outside the Land of Israel. 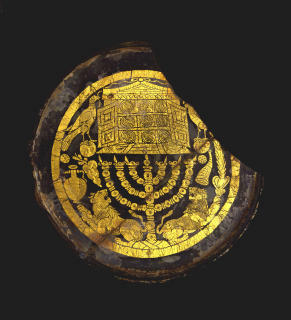 Originally found in catacombs in Rome, they include images of the Holy Ark, the Lions of Judah and the Temple Menorah. In acknowledgement of their historical importance to Israel, the Działyńska heirs have enabled the Israel Museum to retain these two bases for its permanent collection. One has been repurchased by the Museum and the second has been purchased by a Museum patron for long-term loan to the Museum. In the 19th century, the three gold-glass bases became part of a world-renowned collection of paintings, antiquities, ancient glass, medieval and Renaissance enamels and other rare and beautiful objects assembled by Countess Isabella Działyńska née Czartoryska at the Hôtel Lambert, her family home in Paris. She later moved the collection to her castle at Gołuchów in Poland. In June 1939, with war looming, the gold-glasses and other precious items from the collection were taken for safekeeping to Warsaw, but were discovered and seized by the Nazis in 1941. In 1944 they were moved on Hitler’s orders to Castle Fischhorn in Zell am See, Austria, where the collection was looted by the local population and Austrian dealers in the aftermath of the war. In the ensuing decades the family made extensive efforts to locate their looted property with the assistance of government officials and agencies in the USA, Germany and Austria. However, no trace of the gold-glasses was found. Four years ago the family learned that all three gold-glass bases were in the collection of the Israel Museum. The two bases with Jewish motifs were purchased for the Museum in Vienna in 1965 by Israel Museum founder and Jerusalem mayor Teddy Kollek and Israeli art and Judaica dealer Joseph Steiglitz. The third base was acquired by Teddy Kollek in Vienna from the same source at the same time and donated by Teddy and Tamar Kollek to the Israel Museum in 1970. “The restitution of works of art that were stolen or unwillingly sold during the Second World War is a challenging, sensitive, and complex issue. It is therefore rewarding to be able to achieve a resolution in this case which restitutes title to these objects to their rightful heirs while also preserving two of them for the Museum’s collection,” stated James S. Snyder, Anne and Jerome Fisher Director of the Israel Museum, Jerusalem. “We are profoundly grateful to our donors who both recognized the importance of effecting this exemplary act of restitution and enabled us to preserve for display in Jerusalem two unique artifacts of ancient Jewish culture, which connect Jerusalem from Second Temple times with the early history of the Roman Diaspora.”. Gold-glass bases were first discovered in catacombs in Rome in the 17th century, embedded in the walls as tomb markers. Originally the bases of bowls or cups, these bases were believed to have been used by the entombed individuals during their lives. These bases were created by a meticulous process through which gold leaf, affixed to a glass disk, was incised with intricate designs and then encased with a glass bubble to preserve the gold. Of the hundreds of surviving examples, many bear Christian motifs, and fewer than twenty feature Jewish symbols. 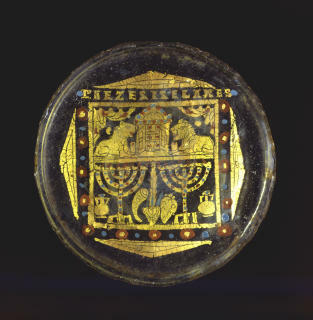 The first gold-glass base with Jewish imagery which is being repurchased by the Israel Museum features an ornate design in gold leaf set in a square frame, divided into two sections and further ornamented with red and blue decoration. The upper section features a Holy Ark with Torah scrolls, flanked by two crouching lions of Judah. The lower section depicts two menorahs surrounded by myrtle and willow branches and two amphorae. Across the top of the base is a well-known Greek benediction, which appears often on drinking vessels, in Latin letters, seemingly addressing the deceased: PIE ZESIS ELARES (“Drink and Live, Elares”). The second base which is being purchased for long-term loan to the Museum includes many of the same Jewish symbols as the first but in a different composition and encircled by a round frame. At the top is a large Holy Ark, with three Torah scrolls visible on each of its three shelves, flanked by a bird on a globe on either side. Below the Ark stands a large Menorah, with crouching lions to either side. 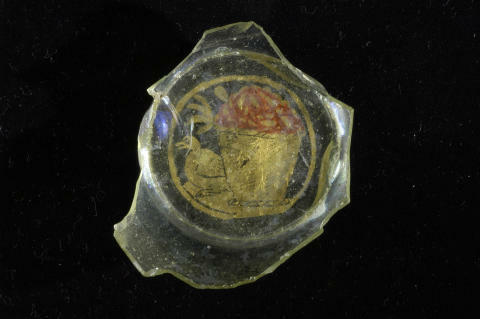 The third base depicts a fruit basket, accented in red, and what is believed to be a duck. There is no known parallel to the scene itself, though there are bases with various genre scenes that resemble the present example in size and format. According to published accounts, this base was discovered in Cologne. The non-profit London-based Commission for Looted Art in Europe is the expert representative body in Europe dealing with all matters relating to Nazi looted art and other cultural property. It negotiates policies and procedures and acts on behalf of families, institutions and governments worldwide to research, identify and recover looted cultural property. In the nine years since it was founded the Commission has been instrumental in the return of some 3,000 cultural objects to their rightful owners.